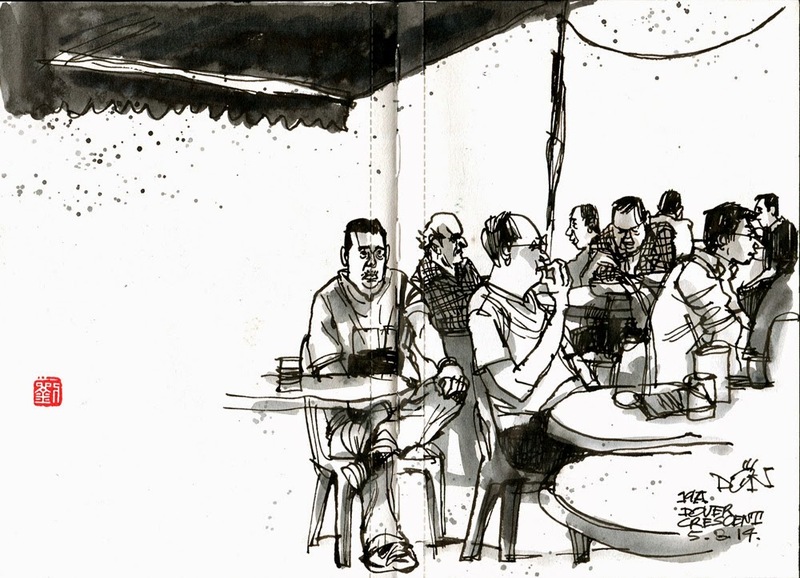 Coffee time - sketch done while a group of us (sketchers) took some time off to have lunch at Dover Crescent, where the infamous XO Fish Head Bee Hoon has moved to from Buona Vista. I was looking forward to the bee hoon soup but sadly my order did not come. Instead, I had wanton noodle, which wasn't too disappointing, fortunately. Or I would be doubly sad. I sketched the smoking corner that was usually located towards the far end of the coffeeshop, where you get to enjoy the sun, wind and the open air. Whereas the non smokers would be seated in the middle where you get the oil, the smoke from cooking, and bad ventilation. So who's suffering? I still prefer second hand smoke, really. At one table, an elderly man was having Heineken, drinking alone, and brooding over his youth. I envied him since I wouldn't be drinking on a hot afternoon like this. The sweltering heat combined with alcohol would cause my face to swell unforgivingly. I need air-conditioning to drink. Then I noticed that it was an all men's corner. Where were the women? I think they were all at home cooking for the men while they were having their smoke and drink and chillaxing out in the glorious open. 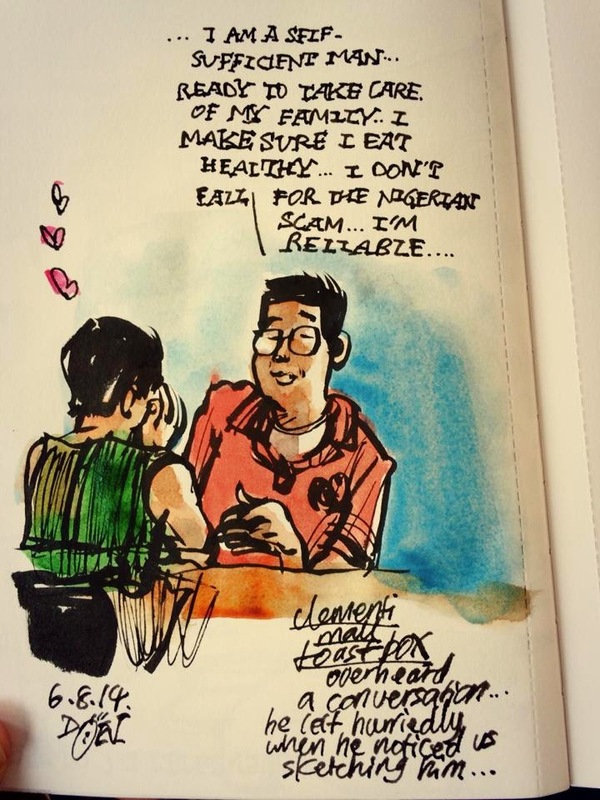 Sketched at Clementi hawker centre during dinner time. 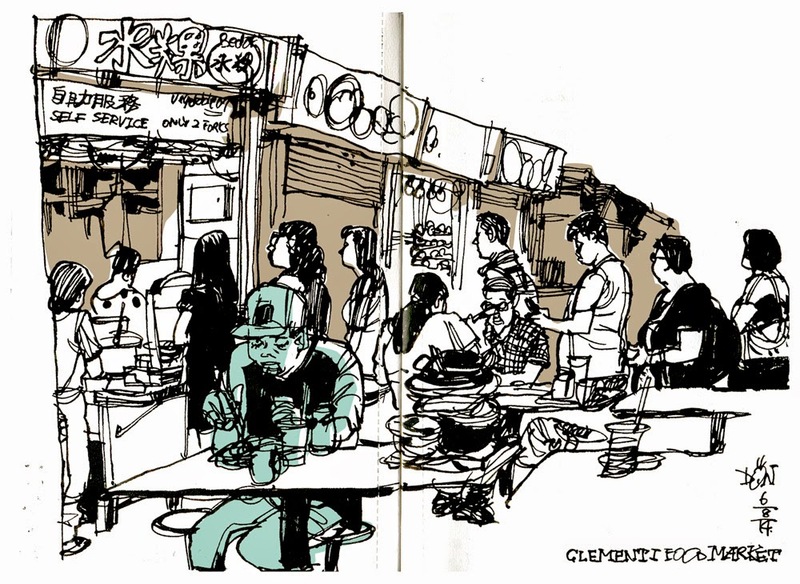 I saw a long queue at the "Chwee Kueh" stall and a great opportunity to sketch the scene. A pile of used plates, bowls and pots became my foreground. The sign above the "Chwee Kueh" stall said it was from Bedok though it was located in Clementi at the moment. Most likely they didn't want anyone here to mistaken that they are not from Clementi, but from Bedok where they were probably very popular. Judging from the line, it is still popular, but I didn't like it, after tasting some bought by my friend who stood in line for 5 minutes. 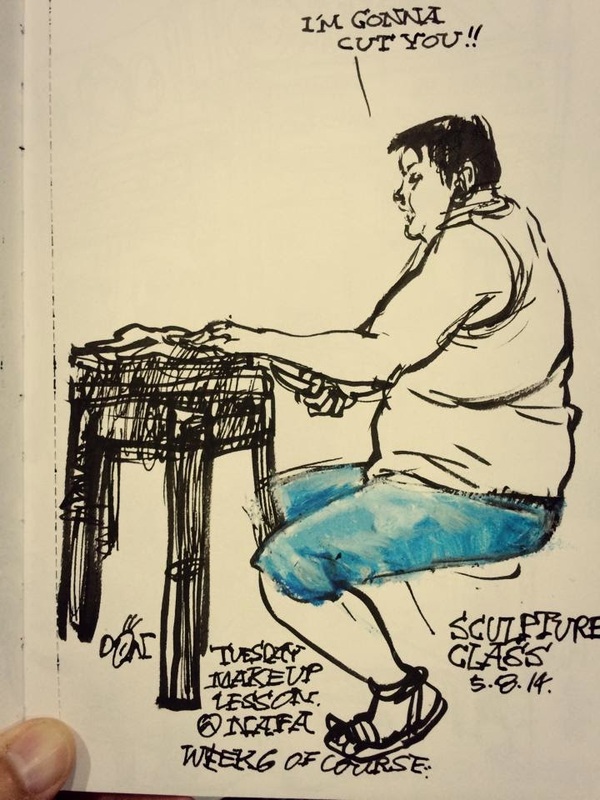 Random: A student from sculpture class. She had her ear phones on and she was singing softly but her pitch made it quite audible. The other students pretended to not hear her as they worked on their projects. I added the text to make her look vicious. She was working on her 3rd quarter project which is a reclining female figure. A man talking at the top of his voice in a cafe. Needless to say, it was a horrible dialogue. I marvelled at the listener who remained attentive throughout. Can't imagine what women have to stand up with all their life.